This plaque is presented with much pleasure by China Travel Services (H.K.) Ltd to commemorate the unveiling of two Chinese Lions by HRH the Duke of Gloucester on the 29 October 1985 (during the quatercentenary year of the City of Westminster) at the formal opening of Gerrard Street China Town. The unveiling ceremony was attended by His Excellency Hu Ding Yi the Ambassador of The People's Republic of China, the Right Worshipful the Lord Mayor of Westminster Councillor Roger Bramble, Mr Colvyn Haye, CBE, the Hong Kong Commissioner and Mr Harry Chi-Cheung Lee President of the China Town Chinese Association (London). 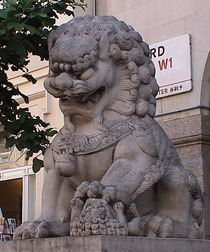 The two Chinese Lions were generously donated by the People's Republic of China. The Sculpture of the Chinese characters on the Gateways were sponsored by the Hong Kong Government. The Chinese Couplets on the Gateways were composed by Mr B. Tran Huynh. The 29th day October 1985. This plaque was unveiled on 7th February 2000 by HRH the Prince of Wales on the occasion of the Royal Visit to London Chinatown to celebrate the Chinese Lunar New Year of the Dragon Millennium 2000. Presented by Mr Tim Yau, MBE, President London Chinatown Chinese Association. Lord Mayor of Westminster 1985-1986. President of the China Town Chinese Association (London).